The Mini Cooper Countryman is the only small car to earn a good rating among the latest group of 12 cars subjected to the Institute's small overlap front crash test. Two electric models and a hybrid also are in the mix, with varied results. The electric-powered Chevrolet Volt (with a gasoline engine "range extender") earns an acceptable rating, while its battery-electric rival, the Nissan Leaf, earns a poor rating. The Ford C-Max Hybrid, a small four-door wagon, earns an acceptable rating. Another small four-door wagon, the gasoline-powered Mazda 5, is rated poor. Five small cars, all 2014 models, earn an acceptable rating, two earn marginal and four earn poor ratings for occupant protection in a small overlap crash in the Institute's latest round of evaluations. The Institute now has evaluated 32 small cars for small overlap front crash protection. Of them, 19 earn a good or acceptable rating and 13 earn marginal or poor. Introduced in 2012, the small overlap test replicates what happens when the front corner of a vehicle collides with another vehicle or an object such as a tree or utility pole. In the test, 25 percent of a vehicle's front end on the driver's side strikes a rigid barrier at 40 mph (see "Small overlap crashes: New consumer-test program aims for even safer vehicles," Aug. 14, 2012). 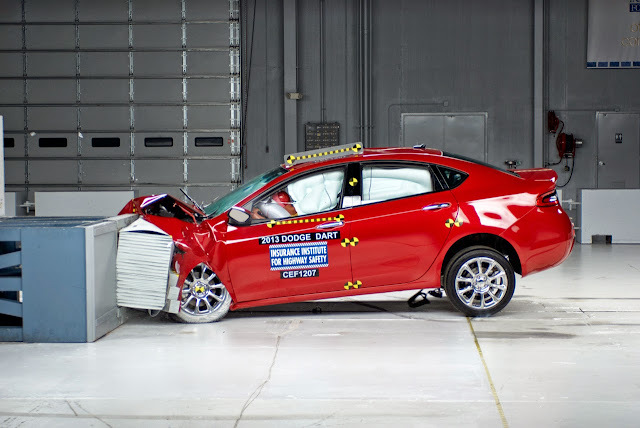 The test is more difficult than either the head-on crashes conducted by the National Highway Traffic Safety Administration or the IIHS moderate overlap test. In the small overlap test, the main structures of the vehicle's front-end crush zone are bypassed, making it hard for the vehicle to manage crash energy. The occupant compartment can collapse as a result. The Countryman, introduced in 2011, is a larger four-door version of the two-door Mini Cooper. The small overlap rating for the Countryman doesn't apply to the two-door model, which hasn't been tested. To earn the top rating of good, automakers need to focus on overall crash protection. That means an occupant compartment that resists intrusion, safety belts that prevent a driver from pitching too far forward and side curtain airbags that provide enough forward coverage to cushion a head at risk of hitting the dashboard or window frame or things outside the vehicle. Collapsing structures can knock front airbags and seats out of position, exacerbating the problem. compromised the driver's survival space, knocking the steering wheel back and to the right of the driver. That put the front airbag out of position so the dummy's head slid off the left side and hit the A-pillar. Although sensors in the head indicate the impact wasn't severe, contact with hard surfaces shouldn't occur. In addition, injury measures taken from the dummy indicate serious injury to the driver's left hip would be likely, and injuries to both lower legs would be possible in a real-world crash of this severity. The Fiat 500L (and 500) earns a poor rating for small overlap front crash protection. The Mazda 5 shares the distinction with two other cars of being the worst-performing models the Institute has evaluated in the small overlap test. The other two are the 2014 Kia Forte, a small car, and the 2012 Prius v, a midsize hybrid. Injury measures taken from the dummy indicate a high risk of injuries to the left thigh and left lower leg in a real-world crash this severe. The steering wheel moved to the right, and the dummy's head barely contacted the front airbag before sliding off the left side. The safety belt allowed the dummy's head and torso to move too far forward, so the head made contact with the left side of the dashboard. The side curtain airbag didn't deploy at all, exposing the head to contacts with side structure and outside objects. Plus, the driver door unlatched during the test, something that shouldn't happen and puts occupants at risk of being ejected from the vehicle. The Mazda 5 also is distinct in that it is the only vehicle in this group to earn a marginal rating in one of the Institute's other four evaluations — moderate overlap front, side, rollover and rear. The Mazda 5 earns a marginal rating in the side impact test. That also makes it the only 2014-model car the Institute has evaluated to earn anything less than acceptable in the side test. Most models earn a good rating. 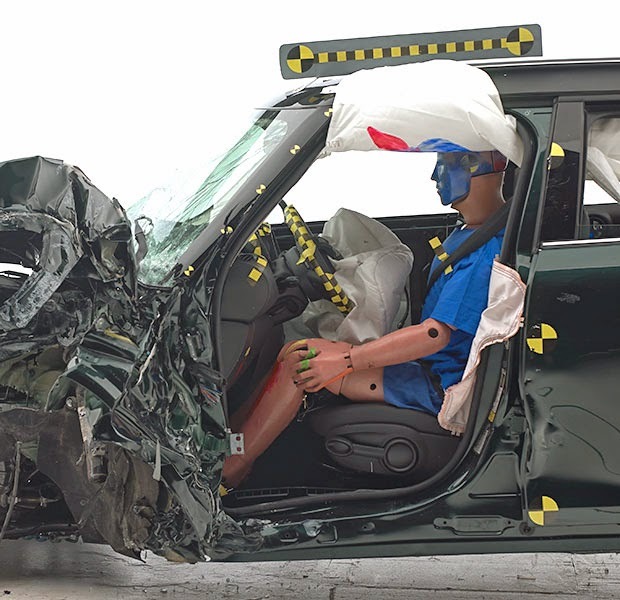 Measures taken from the driver dummy indicate a likely pelvis fracture, and measures taken from the dummy seated in the rear passenger seat indicate that rib fractures and/or other internal organ injuries would be possible in a crash of this severity. Back in 2011, the Chevrolet Volt and Leaf were the first mainstream plug-in electric models to undergo IIHS crash test evaluations. The 2011 models earned top ratings in the moderate overlap front, side, head restraint and roof-strength evaluations (see "Safety now comes in green: 1st crash tests of electric cars," April 26, 2011). That's still the case with the 2014 versions of both cars. Driver space in the Volt was maintained reasonably well in the test, and injury measures taken from the dummy indicate a low risk of any significant injuries to a person in a similar crash. In the Leaf, the dummy had a different experience. The Leaf chalked up as much as 16 inches of intrusion in the lower occupant compartment and 14 inches in the upper occupant compartment. The instrument panel, parking brake pedal and steering column were all pushed back toward the driver. Injuries to the left knee and left lower leg would be likely in a crash of this severity, and injuries to the left thigh would be possible. Small overlap front crash test ratings for small cars, 2014 models! The Volt, which has a basic-rated optional forward collision warning system, is the only car in this test group to earn a 2014 Top Safety Pick+ award. The C-Max Hybrid, Countryman, Mitsubishi Lancer, and the Scion FR-S and its twin the Subaru BRZ qualify for Top Safety Pick, the Institute's second-highest award. These models miss the "plus" award because they don't have an available front crash prevention system. To qualify for Top Safety Pick+, a vehicle must earn a good or acceptable rating for small overlap protection, a good rating in the Institute's other four tests, and a basic, advanced or superior rating for front crash prevention. When testing hybrid or electric models, IIHS follows special safety protocols. Post crash, technicians check for high voltage and high temperature, which could lead to a potentially fatal electrical shock and/or fire. No one can touch the car until given the all-clear. Technicians wear safety gear, including eye protection, rubber boots and rubber gloves. They’re tethered at the waist to a long pole, which can be used to pull them away from the vehicle in an emergency. No issues with the batteries or electric systems were seen in the Volt and Leaf tests. To qualify for Top Safety Pick, a vehicle must earn a good or acceptable rating for small overlap protection and a good rating in the other four tests. Source IIHS © , please read more.